杨继春, 杨智荣, 于树青, 詹思延, 孙凤. Yang Jichun, Yang Zhirong, Yu Shuqing, Zhan Siyan, Sun Feng. Yang Jichun, Yang Zhirong, Yu Shuqing, Zhan Siyan, Sun Feng. Introduction on 'assessing the risk of bias of individual studies' in systematic review of health-care intervention programs revised by the Agency for Healthcare Research and Quality[J]. Chinese Journal of Epidemiology, 2019, 40(1): 106-111. Abstract: This paper summarizes the Risk of Bias of Individual Studies in Systematic Reviews of Health Care Interventions revised by the Agency for Healthcare Research and Quality (AHRQ) and introduces how to use Revman software make risk of bias graph or risk of bias summary. AHRQ tool can be used to evaluate following study designs:RCTs, cohort study, case-control study (including nested case-control), case series study and cross-sectional study. The tool evaluates the risk of bias of individual studies from selection bias, performance bias, attrition bias, detection bias and reporting bias. Each of the bias domains contains different items, and each item is available for the assessment of one or more study designs. It is worth noting that the appropriate items should be selected for evaluation different study designs instead of using all items to directly assess the risk of bias. AHRQ tool can be used to evaluate risk of bias individual studies when systematic reviews of health care interventions is including different study designs. Moreover, the tool items are relatively easy to understand and the assessment process is not complicated. AHRQ recommends the use of high, medium and low risk classification methods to assess the overall risk of bias of individual studies. However, AHRQ gives no recommendations on how to determine the overall bias grade. It is expected that future research will give corresponding recommendations. 杨智荣, 孙凤, 詹思延. 偏倚风险评估系列:(一)概述[J]. 中华流行病学杂志, 2017, 38(7): 983-987. Higgins JPT, Green S. Cochrane handbook for systematic reviews of interventions[M]. Chichester, UK: John Wiley & Sons, 2011. Risk of bias 2.0' tool|Cochrane Methods[EB/OL].(2018)[2018-05-01]. http://methods.cochrane.org/risk-bias-20-tool. 吕晓珍, 孙凤, 詹思延. 偏倚风险评估系列:(四)整群设计随机对照试验[J]. 中华流行病学杂志, 2018, 39(2): 240-244. 武珊珊, 孙凤, 詹思延. 偏倚风险评估系列:(三)交叉设计随机对照试验[J]. 中华流行病学杂志, 2017, 38(10): 1436-1440. 杨智荣, 孙凤, 詹思延. 偏倚风险评估系列:(二)平行设计随机对照试验偏倚评估工具2.0介绍[J]. 中华流行病学杂志, 2017, 38(9): 1285-1291. Wells G, Shea B, O'Connell D, et al. Newcastle-Ottawa quality assessment scale cohort studies[EB/OL]. (2014)[2018-05-01]. http://www.ohri.ca/programs/clinical_epidemiology/oxford.asp. 曾宪涛, 刘慧, 陈曦, 等. Meta分析系列之四:观察性研究的质量评价工具[J]. 中国循证心血管医学杂志, 2012, 4(4): 297-299. National institute for clinical excellence. NICE clinical guidelines, Appendix 4 Quality of case series form[EB/OL]. (2015)[2018-05-01]. http://www.nice.org.uk/nicemedia/pdf/Appendix_04_qualityofcase_series_form_preop.pdf. 王小琴, 陈耀龙, 渠清源, 等. 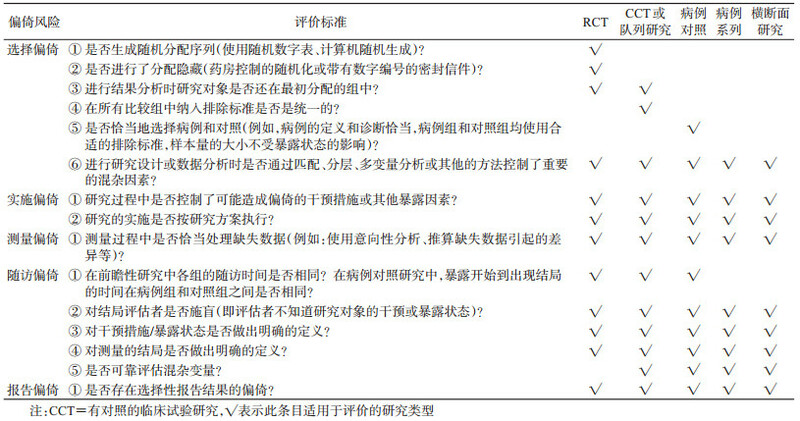 病例系列研究方法学质量评价工具解读[J]. 中国循证儿科杂志, 2015, 10(5): 381-385. 孙凤, 高乐, 杨智荣, 等. 偏倚风险评估系列:(五)非随机干预性研究[J]. 中华流行病学杂志, 2018, 39(3): 374-381. Bigby M. Challenges to the hierarchy of evidence:does the emperor have no clothes?[J]. Arch Dermatol, 2001, 137(3): 345-346. Methods Guide for Effectiveness and Comparative Effectiveness Reviews[EB/OL]. (2014-01)[2018-05-01]. https: //effectiv ehealthcare.ahrq.gov/sites/default/files/pdf/cer-methods-guide_o verview.pdf. Viswanathan M, Ansari MT, Berkman ND, et al. Assessing the Risk of Bias of Individual Studies in Systematic Reviews of Health Care Interventions[Z]. Methods Guide for Effectiveness and Comparative Effectiveness Reviews, 2008. Cochrane. RevMan 5.3 User Guide[EB/OL]. (2014-06-24)[2018-05-01]. http://community.cochrane.org/sites/default/files/uploads/inline-files/RevMan_5.3_User_Guide.pdf. 何俐. Cochrane系统评价软件RevMan简介[J]. 中国循证医学, 2001, 1(3): 168-169. 徐世侠, 汤先华, 陈海青. Meta分析及RevMan软件介绍[J]. 中华医学图书情报杂志, 2009, 18(3): 61-63. 钟文昭, 吴一龙, 谷力加. Review Manager(RevMan)-临床医生通向Meta分析的桥梁[J]. 循证医学, 2003, 3(4): 234-246. 曾宪涛, 包翠萍, 曹世义, 等. Meta分析系列之三:随机对照试验的质量评价工具[J]. 中国循证心血管医学杂志, 2012, 4(3): 183-185.